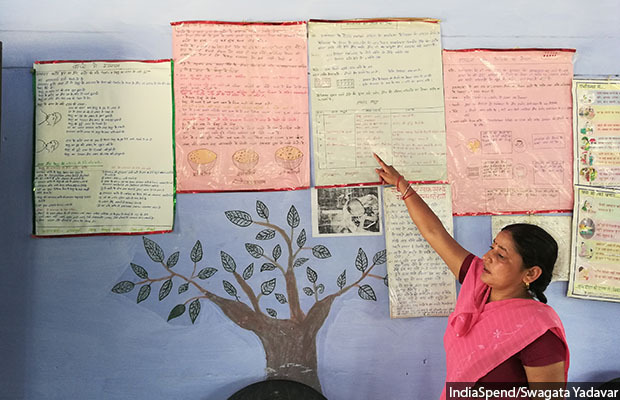 Anganwadi worker Madhubala, 47, at a pre-school education class at an anganwadi held in a primary school in Kuiya village, Farrukhabad. I read this article and found it very interesting, thought it might be something for you. The article is called Why Health Workers, Paid Rs 4,000 Per Month, Are Vital To India’s National Nutrition Mission https://www.indiaspend.com/why-health-workers-paid-rs-4000-per-month-are-vital-to-indias-national-nutrition-mission-22093/. Farrukhabad, Uttar Pradesh: Every morning, 26-year-old Meenakshi Gangwar packs a rucksack--a baby doll, a register and some nutrition charts--and sets off on her scooter to visit one of the 41 anganwadis (day care centres) that she is in charge of. Gangwar works as a poshan sakhi (nutrition buddy) in Uttar Pradesh’s Technical Support Unit (UP TSU) that provides technical and managerial support to government staff at various levels of the health system, from anganwadis to community health centres (CHCs), and works under the non-profit India Health Action Trust. She is stationed at the Barhpur block of Farrukhabad district of central Uttar Pradesh (UP), a district that reports some of the better nutrition indicators in UP. Poshan sakhis such as Gangwar have the task of supporting and helping anganwadi workers (AWWs) to do their duties correctly--from maintaining records correctly to counseling mothers on nutrition. Gangwar’s job is important because frontline workers such as AWWs face innumerable local challenges like lack of training, poor infrastructure, irregular supply of supplementary nutrition and poor supervision. These support services are essential to the success of POSHAN Abhiyan or National Nutrition Mission, launched in March 2018 with the aim to reduce low birth weight, stunting and anaemia in women and children. As part of an ongoing series on efforts to combat malnutrition, IndiaSpend reports from Farrukhabad how training and support for frontline workers can help beat India’s malnutrition challenge. India’s Integrated Child Development Scheme (ICDS), the world’s largest childcare programme, provides food, preschool education and primary healthcare to children under six years of age and their mothers. This is done through anganwadis, whose charter of duties includes providing cooked meals and take-home supplements, health and nutrition education, immunisation, health check-ups and referral services. Under ICDS, the person who shoulders the responsibility of on-the-ground implementation is the AWW. Usually, she is a local village woman, between 18 to 35 years of age and educated up to grade X. She gets paid around Rs 4,000 per month--below India’s per capita monthly income of Rs 7,204 albeit greater than UP’s Rs 2,974. Meanwhile, nutrition and child and maternal health are central aims of the National Rural Health Mission, too, which functions at the grassroots through Accredited Social Health Workers (ASHAs). ASHAs are part-time female workers recruited from local communities and educated at least up to grade VIII. They do not receive a salary, but get monetary incentives for specific activities. Together, AWWs and ASHAs form the frontline of India’s war against malnutrition, but they are often poorly trained, ill-paid and provided little support. The first thing Ganwar does on reaching a centre is to check the records. Each AWW is given some 11 registers to record the health information of young children, lactating mothers and pregnant women. Most AWWs struggle because they are not trained in how to fill out the registers and why it is important. Part of Gangwar’s duty is to explain this. She also conducts home visits with AWWs and helps them counsel mothers. She also has to ensure AWWs conduct monthly health and nutrition days in each village. Nearly half (46.3%) of Uttar Pradesh’s children under five years of age, numbering 14.3 million, are stunted. Seventy-one of its 75 districts report stunting in more than 40% children under five. Clearly, Uttar Pradesh is failing to effectively use the ICDS programme. About 76% of intended beneficiaries--lactating mothers, children below six, pregnant mothers--in the state did not avail supplementary nutrition in anganwadis, according to the Rapid Survey on Children (RSOC, 2013-14). Between 2010 and 2014, the Comptroller and Auditor General found a 34% shortage of anganwadi centres and inefficient utilisation of ICDS funds, leaving Rs 517 crore of the state’s ICDS budget unutilised. Funds for hot cooked meals were not released in 17 of 20 districts examined, which resulted in supply of hot cooked meals for only 2-9 months in the year. The audit found the number of severely malnourished children to have increased more than four-fold from 28,000 in 2010 to 146,000 in 2014. The state government has been implementing new nutrition schemes every few years without resolving implementation problems. The Samajwadi Party, which ruled the state from 2012 to 2017, started the Hausla Poshan Yojana in 2016, under which severely malnourished children were entitled to half a kilogram of desi ghee per month, glucose biscuits or other nutritious snacks, fruit and one hot cooked meal at an anganwadi every day. Pregnant women were to be provided a hot, cooked meal thrice a week at an anganwadi. The nutritional support, including curd, ghee and fruit, was supposed to cover 60% of the calorie requirements of pregnant women and children. The scheme ran only for a month and a half, after which the government stopped providing funds for it, Scroll.in reported in February 2017. The scheme was formally discontinued after the Bharatiya Janata Party formed a government under Yogi Adityanath in March 2017. The Yogi government launched its own nutrition programme, called the Sustaining Health and Nutrition Above Red Indicator (SHABRI) Sankalp Yojana, with the professed aim of battling malnutrition in the worst affected districts, numbering 39 (and including Farrukhabad and Chitrakoot, which IndiaSpend visited for its ground reporting). Under this scheme, children below the age of three are weighed and assigned to ‘yellow’ (standing for moderately underweight) and ‘red’ (severely underweight) categories to be treated accordingly. The aim is to reduce the malnutrition rate by 2% by December 2018. As under the central government’s POSHAN Abhiyan, this scheme also aims at “convergence” between the departments of women and child development, health and family welfare, food and public distribution, education, rural development and panchayati raj in a concerted effort against malnutrition. As with previous schemes, it is implementation on the ground that will decide the success or failure of this programme. Experts say consistent efforts and constant monitoring are imperative. And for this, frontline workers have to be appropriately trained and supported. It was a Wednesday in the month of May, and ANM Archana, ASHA Kamlesh and AWW Geeta were visiting Budnamo village for its weekly immunisation day. ANM Archana counselling a mother after immunisation at Badnamo village in Farrukhabad district in central Uttar Pradesh. Armed with a cold box for vaccines and a list of children to be immunised, they head towards a house with a newborn whose family were refusing to have the BCG (Bacille Calmette-Guérin) vaccine administered. “My husband is against the idea. He says it is unnecessary, the baby is too young for injections,” said the mother-in-law. Kamlesh, Geeta and Gangwar tried to convince her of the importance of immunisation, but the family did not relent. “We heard of one child getting sick after getting the sui [vaccination],” they said. The mother-in-law spoke of someone who had a premature delivery after getting a tetanus shot. Frontline health workers must fight such misinformation and superstition. Even one missed immunisation threatens an entire community with disease. In the face of the family’s resistance, the team decided to administer the BCG vaccine along with other vaccines due at six weeks. In addition, there are numerous infrastructure and administration challenges they must overcome. And, they are overworked. An AWW is entrusted with many non-ICDS tasks--such as preparing voter IDs, conducting census, employment or Swachh Bharat Mission (Clean India Mission) surveys and helming election booths--none of which is paid work except for election duty. Trainings happen once every four to five years, even though AWWs’ requirements change a rapidly as do those of the communities they serve. Promotions are too infrequent to offer an incentive to work hard, even as numerous supervisor positions remain vacant. Most AWWs said they received their pay at least four months late. “I am doing this job because there are no opportunities in the village,” said Indradevi, who said she had a bachelor’s degree in economics. The supervisors do not have it easy, either. 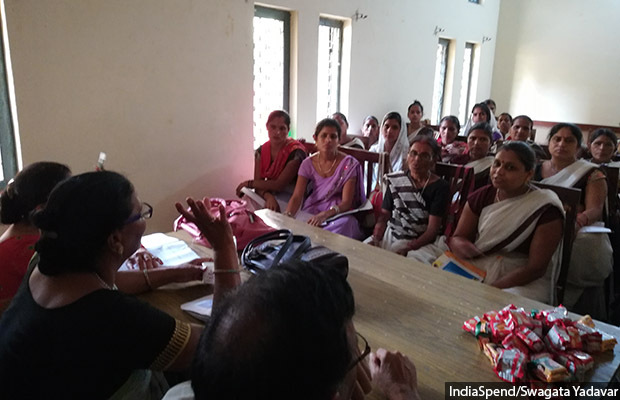 Sunita Dubey, one of three anganwadi supervisors for 203 anganwadi centres in Rajepur block, said one of them is always in the office to attend to visiting officials, leaving two of them to handle field visits that are too many for even all three of them. There is no vehicle and no reimbursement for their travel, they said, so they travel by shared jeeps and buses. “We don’t get as much time with anganwadi workers as we would like,” she said. Most of the time, she said, the troubles that anganwadis have are at the local level with the gram panchayat (village council) or pradhan (village council head). “We can’t really solve those problems but only support them,” she said. Anganwadis have no toys to keep children engaged and make them want to attend every day. When IndiaSpend visited the anganwadi centre of Gadhiya village in Rajepur block, children sat in the verandah of the primary school where the centre is housed. With no boundary wall, the children sat near heaps of cow-dung and hay. “It is too hot for children to sit inside,” said Indradevi, the anganwadi worker. The centre had no electricity. Inside the classroom allotted to the anganwadi, there was a single broken bench and the floor was uneven and cracked. The school was being renovated, but not the anganwadi. Anganwadi worker Indradevi at the centre in Gadhiya village of Farrukhabad district. “The school doesn’t allow children to use its toilets, even we aren’t given the key to the toilet, which remains locked,” AWW Indradevi said. Every morning she goes around town asking parents to send their children to the centre, but parents are reluctant due to the summer heat, especially as the centre is serving no food. Due to irregular supply of supplementary nutrition, AWWs buy biscuits and puffed rice from their own pocket to incentivise children to attend. Poor infrastructure, irregular food supplies and poor training of AWWs have been noted in numerous studies (such as here, here and here) on ICDS from across India. Only about 35% of sample households in Bhojpur district of Bihar reported receiving immunisation, food supplements, pregnancy care information or nutrition information in a 2015 study by the International Food Policy Research Institute, which examined the coverage of essential services by ICDS and National Health Mission. The study showed that monetary incentives could improve AWWs’ performance and enable better provision of information to families. “Incentives may motivate them to reduce attrition and improve performance,” it said, referring to AWWs and ASHAs. It further suggested that simply arming ASHAs with more knowledge would not work as well as ensuring that service delivery protocols such as maintaining registers are complied with. This is why external help and support, such as what TSU provides, is important. The anganwadi centre at Pitrupar Mehendia village in Barhpur block of Farrukhabad, is clean and tidy. AWW Annapurna, mentioned earlier, has been running this centre since 2002. Anganwadi worker Annapurna explaining nutrition charts at Pitrupar Mehendia village in Farrukhabad. Before mentorship from poshan sakhi Gangwar, mentioned earlier, Annapurna said she did not pay importance to counselling and rarely ever undertook home visits. Now her registers are completely filled out, and she counsels mothers on good food habits in a counselling corner equipped with charts and graphs. In India’s rural healthcare setup, an ASHA serves as a healthcare facilitator to the community, paying special attention to children’s and women’s health. She goes door to door visiting the poorest and most vulnerable, counselling couples and pregnant women, helping with village health plans, providing medical care for minor ailments such as diarrhoea and first aid for minor injuries, and carrying out immunisations. ASHAs are usually village women educated up to grade VIII, each catering to a population of 1,000. Most ASHAs are considered volunteers and only paid Rs 1,000 to 2,000 per month as incentives. ASHA workers at a training session on non-communicable diseases in Farrukhabad. An ASHA is a crucial agent to detect and prevent malnutrition in children. However, a 2015 study in north Bihar found that only 25% ASHAs had an understanding of their role, and 70-90% said they needed better training, monetary support and timely replenishment of their drug kits. Most ASHAs are involved in maternal and child care but did not work in local health planning or other duties related to health activism, IndiaSpend had reported in May 2017. Kavita Gangwar, 38, works with TSU as a mentor to the ASHA sangini or supervisor, accompanying them on home visits to observe the kind of counselling they conduct. She corrects them when needed. Then she reports back to her higher-ups--the block coordinator-programme manager and block programme manager--on whether the ASHAs have their kits, if their equipment works and if their registers are correctly filled out. Kavita Gangwar reminds ASHAs of the health information they have to impart--tell the mother of the importance of not bathing the newborn for the first seven days, teach them how to clean the umbilical cord, explain to them the importance of exclusive breastfeeding for six months, and so on. Apart from the counselling, she has to be present at each village’s health and nutrition days--held once a month--where she also meets the anganwadi worker, ASHAs and ANMs, and also the weekly cluster meetings between ASHAs, ASHA sanginis and ASHA sangini mentors of two-three sub-centres. A sub-centre is the first point of contact between the government primary healthcare system and a community; one sub-centre usually serves a population of 3,000 in hilly/tribal/difficult areas and 5,000 in plain areas. Each sub-centre is required to be staffed with at least one ANM/female health worker and one male health worker. In addition to improving antenatal care for mothers, TSU is working to improve the skills of ANMs and staff nurses. ANMs provide comprehensive primary care at the village level including immunisation, antenatal care and conducting deliveries. Even though ANMs are adequately deployed in sub-centres in UP, few actually conduct deliveries because of lack of facilities like electricity, water supply and toilets--35.9% sub-centres do not have electricity and 35.2% do not have all-weather approach roads, according to 2017 Rural Health Statistics. In Farrukhabad, most deliveries are referred to primary health centres (referral units for six sub-centres, to be staffed with a Medical Officer supported by 14 paramedical and other staff) and community health centres (referral units for four primary health centres, to be staffed with four Medical Specialists i.e. surgeon, physician, gynaecologist and paediatrician supported by paramedical and other staff) because of the easier accessibility from villages. 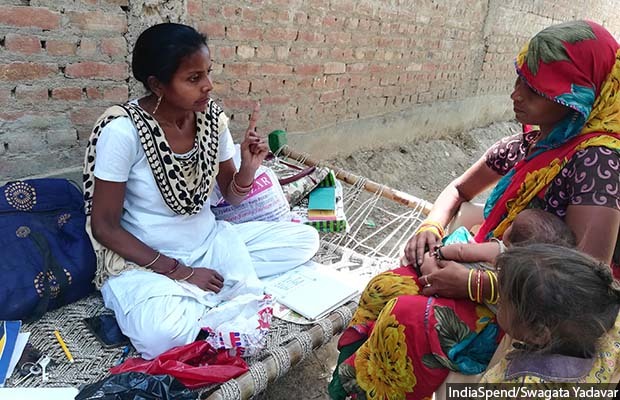 When IndiaSpend visited Farrukhabad’s Kamalgunj community health centre, it was using operational practices that Shikha Kandhil, 24, a nurse mentor with TSU, had introduced when she had started work here four years ago. Serving the needs of 120 villages and a population of 150,000, community health centres are supposed to have 30 beds served by four specialists and a supporting staff of 21. In reality, Uttar Pradesh has among the most specialist positions vacant in India. At Kamalgunj CHC, there were two doctors--one medical officer who attends to paediatric cases and a gynaecologist. Everything else was being managed by the seven staff nurses. Kandhil also mentors 37 ANMs along with the staff nurses, for which she conducts weekly meetings to help with antenatal and postnatal care such as taking blood pressure, haemoglobin, weight, etc. Apart from assisting the nurses in their work, Kandhil conducts training sessions for them on new guidelines and techniques as well as refresher courses. After her training, the centre has started adopting global best practices such as ensuring that newborns are placed skin-to-skin with the mother early on and fed ‘first milk’ or colostrum, which strengthens the baby’s immune system. Despite the challenges we have described, frontline workers are the interface to most government health and nutrition services and evidence has shown that they are effective in delivering them. In fact, about 15% of child deaths below five can be prevented as well as a fifth of stunting if 90% children get nutrition-based interventions. The key is in motivating and helping them perform their duties well. “Frontline workers need to have clear understanding of their roles and responsibilities and not get pulled [into] non-service related tasks,” said Rasmi Avula, research fellow at the International Food Policy Research Institute. Supportive supervision, feedback, recognition and timely pay also help. “[Frontline workers] list respect by the community as one of the things that motivates them,” Avula said, adding that in order to win this trust, they need to be trained well and receive supportive supervision so that they are positioned as reliable sources of information and knowledge. After induction training, there is a clear gap in refresher training, which becomes especially in case of AWWs. “There is evidence around the world that shows repeated trainings help performance,” said Somashekhar Nimbalkar, head of pediatrics at Pramukhswami Medical college, Gujarat. “Without monitoring even programmes that are working well worsen over time.” he added.